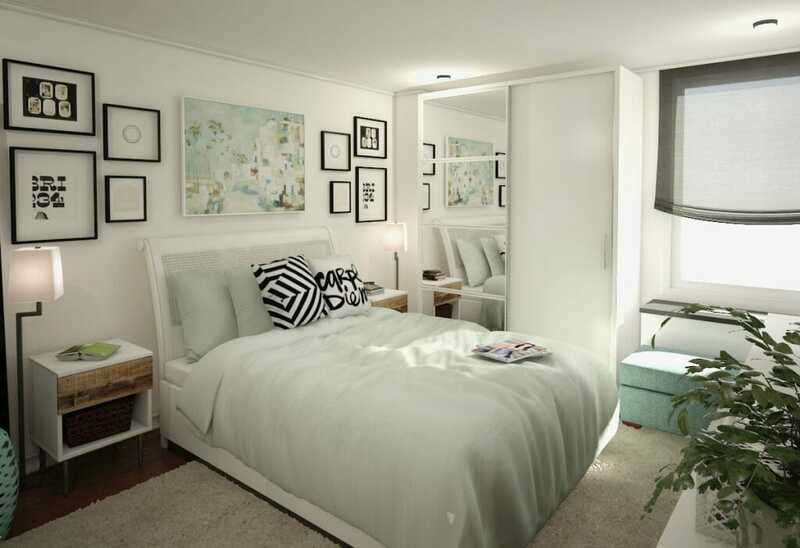 Bedrooms tend to beg for smart layouts that include many storage ideas along with a cohesive design. With clothing, shoes, and personal items, it can be tricky to create a space that is both functional and a relaxing haven. 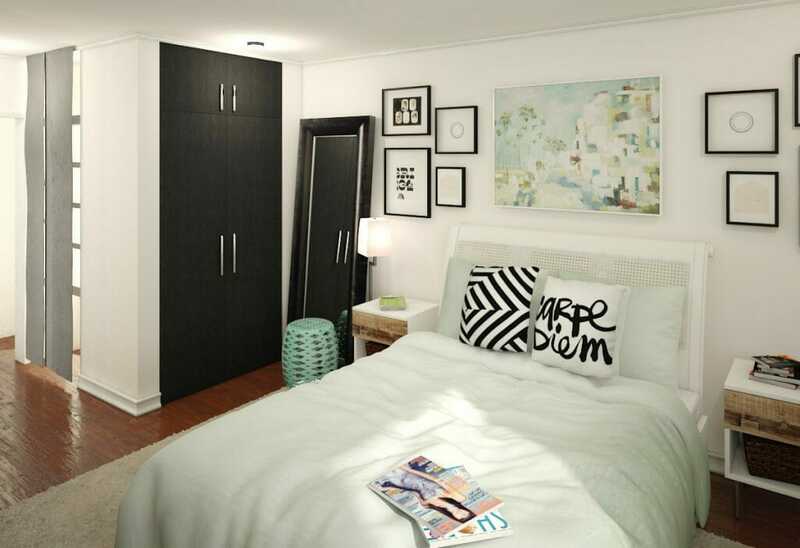 So, how do we optimize a bedroom design to make it storage savvy and beautiful? 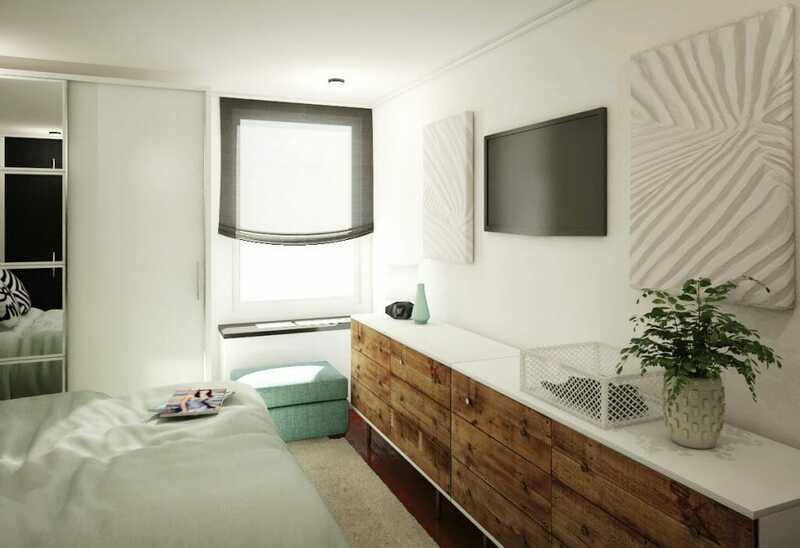 With the wish of “investing in smart storage because of limited space”, a newlywed couple decided to try a new online interior design service to solve their decorating dilemmas. In addition to merging design styles, their focus was on a floor plan that would efficiently accommodate their belongings. The result is a transformation of a cluttered and uninspiring space to an organized and comfortable online interior designer bedroom. 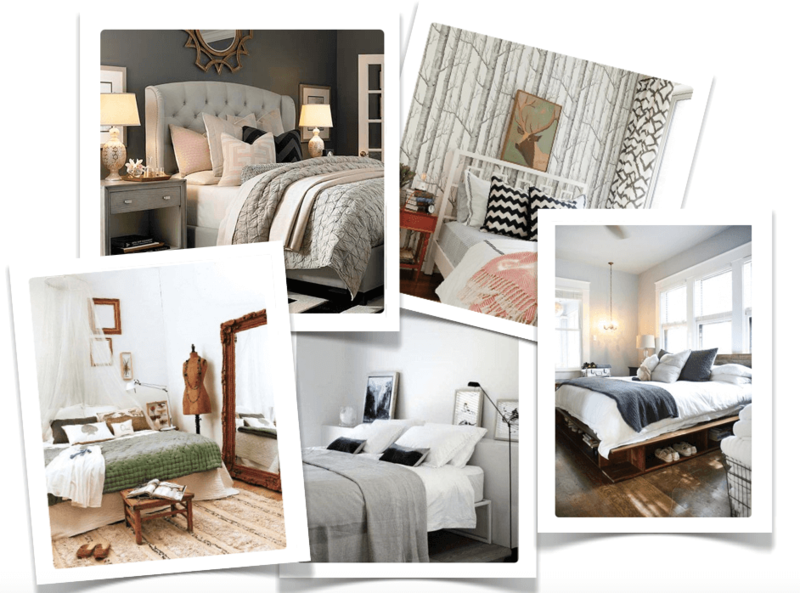 A Pinterest board helped online interior designer, Anna T., to view the different styles of her clients. 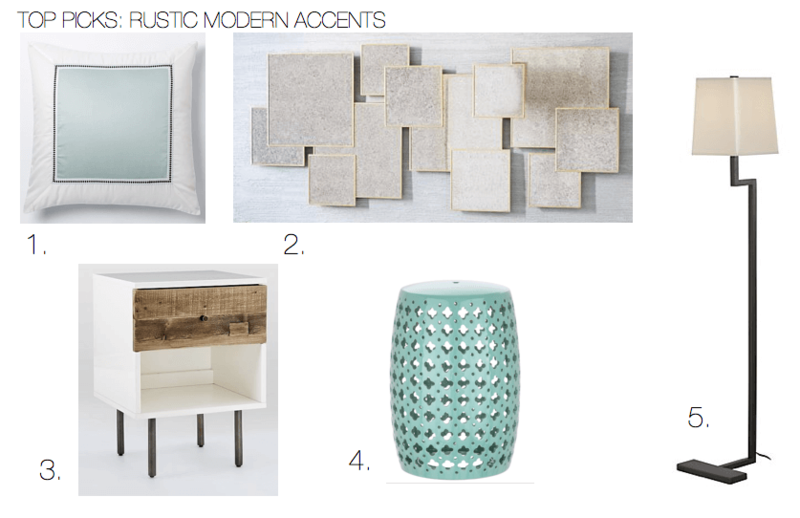 These inspiration images helped guide a design direction that includes modern and rustic elements. 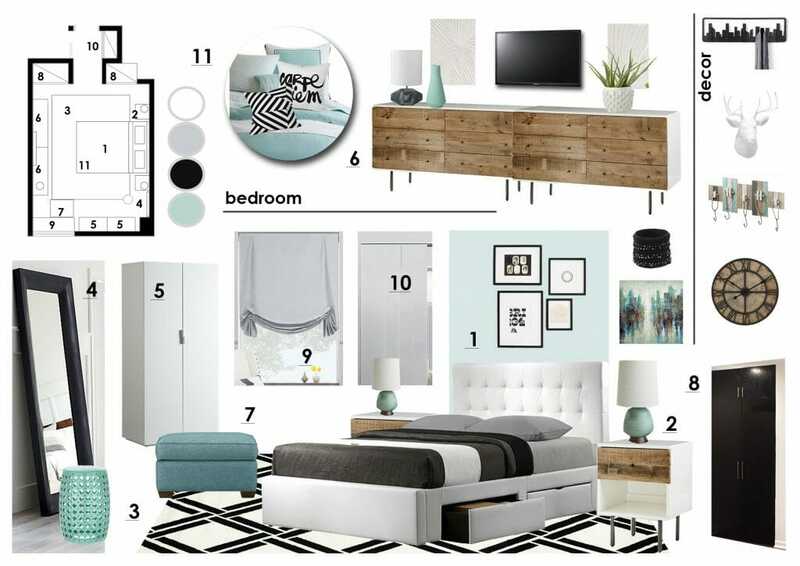 With a focus on storage ideas, Anna’s concept board includes pieces like a bed frame with built in drawers, a couple of spacious dressers, and cool wall hooks. Benjamin Moore’s soft hue, Gray Cloud (2126-60), creates a tranquil backdrop for Anna’s online interior designer bedroom. Pale turquoise pieces give into the preference for pastels, while small accents of black brings in a sharper, modern feel. Two dressers share the long wall space and provide the couple with much needed storage without the use of armoires that overwhelm the space. The combination of white lacquer and reclaimed wood finishes are a great way of merging contemporary and rustic styles. Panel track blinds are the perfect and easy solution to hide storage shelves at the entrance of the room. Anna also incorporated a full length mirror which enhances the appearance of the room size and reflects light. For more on Anna T.’s work, check out our Designer Spotlight post. 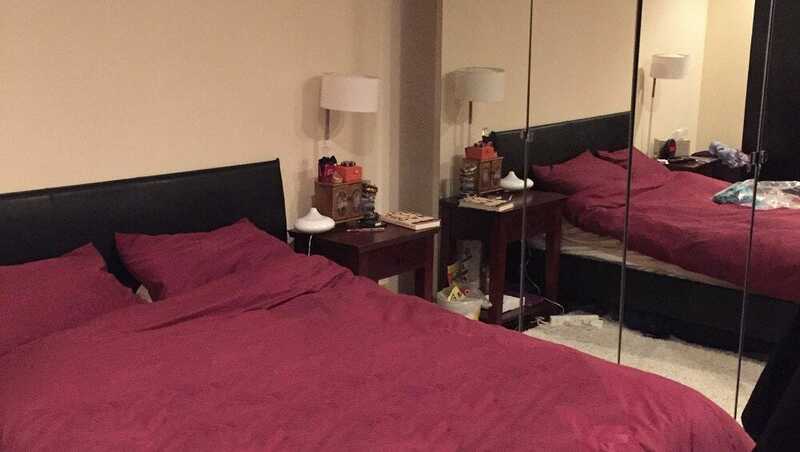 Inspired by this online interior designer bedroom transformation? Check out our online interior design service now to get proposals from multiple professional designers and a beautiful, spatially functional design.